The biggest and most prestigious race for two-year-olds in Australia, and the one with the biggest prize money on offer in the world, is set to be held at the Rosehill Gardens Racecourse on Saturday. The Golden Slipper, one of the highlights of the Australian racing season, always attracts huge numbers, and this year will be no different, with a strong field contesting the $3,500,000 in prize money. The Snowden-McEvoy combination will be keen to see favourite Earthquake to the line, but will have to look out for the challengers, most notably the Hawkes’ Mossfun, who has seen a lot of interest in the week. The best place to have a bet on the 2014 Golden Slipper is with Bet365.com. The odds below were taken from the site, and you will be able to find the latest race odds there as well. Bet365.com is also offering each-way betting on the race, with which you will receive 1/4 if should your selection place in positions one to three. All the talk and the preparations that go into a race like this at times allows the numbers to be overlooked, but in this case, it will be difficult to do so with the impressive Earthquake in the mix. Snowden’s latest wonder two-year-old is unbeaten from four starts, and by all indications is set to bring the number to five come Saturday night. A winner in the Blue Diamond Stakes, followed by another Group 2 win at Rosehill, where he beat of Mossfun, proved his credentials for the big occasions, and Saturday’s race will be a litmus test for the durability and consistency of Snowden’s horse. Michael, Wayne and John Hawkes have brought a strong prospect into the Golden Slipper in the form of Mossfun, the young sprinter having won in all but one of his four starts: that Reisling Stakes defeat at the hands of Earthquake. However, wins in the Silver Slipper, the Widden Stakes and the Inglis Nursery should not be taken lightly and he remains more than a decent proposition for Earthquake to judge himself against. The main focus for the race has been on the top two lines of betting, though this does not mean that the rest of the field should be overlooked. Oakleigh Girl, who will start alongside Mossfun in gate 10, is a winner of two trial races, and has since placed second behind Unencumbered in the 1200-metre Magic Millions 2YO Classic at Gold Coast. Peter Snowden’s other main runner in the field, Ghilbellines, found a favourable draw and will start in gate 2, and is in contention following a Group 2 win in the same distance and the same track. Valentia and Bring Me The Maid also both won their last starts, in Group 2 races. As mentioned above, the best racebook to place a bet on the 2014 Golden Slipper is Bet365.com, who will offer the best odds on the race. When visiting Bet365.com, click on ‘Horse Racing’ in the left sidebar and scroll down to the Antepost section of the page, where you will find the markets for this race and many more. 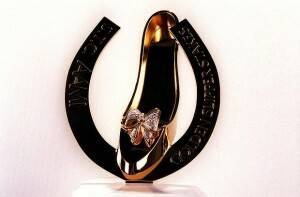 The Golden Slipper is the richest race for two year olds in the world and is run at the Rosehill Gardens Racecourse in Sydney over a distance of 1,200 metres. The race has a purse of $3,500,000 and is one of the biggest races in the Australian horse racing season, as well as being the premier two-year-old race in the country.